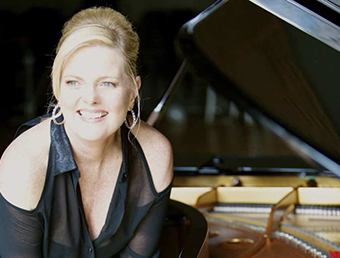 Carol Welsman is an internationally acclaimed singer and pianist whose expressive vocal styling and dynamic stage presence have captivated audiences around the world. Granddaughter of the founder and first conductor of the Toronto Symphony Orchestra, Carol was born with music in her soul. Carol mastered the violin and bass before finishing high school. Her passion for jazz led her to Boston’s Berklee College of Music where she majored in piano performance. She later traveled to Europe and teamed up as a songwriter with Romano Musumarra, writing lyrics for artists like Ray Charles, Pavarotti, Celine Dion and Nicole Scherzinger. Fluent in French, Italian and Spanish in addition to her native English, Carol blends languages (including Portuguese) and rhythms with a versatile repertoire including swing, samba, R & B, pop and jazz. She delivers a mix of American Songbook classics and original compositions in a style that ranges from sensuous and warm to infectious and energetic. In addition to her six Juno Award nominations (Canadian equivalent of Grammy® Awards), Carol has received a number of awards including Vocalist of the Year in the 1996 National Jazz Awards, Distinguished Alumni Award from Berklee College of Music (2002), Pianist & Vocalist of the Year at the 2006 and 2008 Canadian Smooth Jazz Awards.